If you need an airbag wrongful death attorney, we can help fight your airbag wrongful death claim throughout the United States. Whether through our firm, or our network of national wrongful death attorneys, our team can investigate the wrongful death, and fight to get you the compensation and justice you deserve. Contact us now to find out if you are entitled to compensation for an airbag wrongful death at 800-337-7755. 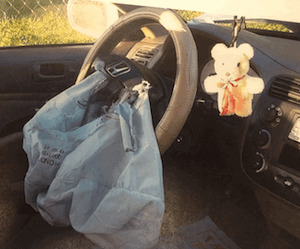 What is an airbag wrongful death claim? An airbag wrongful death case can arise when a driver or passenger is killed as a result of an airbag. This may include an airbag defect or malfunction which causes or contribute to the accidental death. Airbag deploys with too much force and snaps the neck or breaks the neck of the driver or passenger leading to death. A piece of metal for the airbag housing ruptures or explodes when the airbag deploys and causes a piece of metal to strike a major vein or artery in the leg, neck or chest causing the victim to bleed out and die. Metal from the airbag housing or inflator explodes or ruptures causing a piece of metal to shoot through the airbag itself and strike any major organ of the victim including the heart lungs and brain. Who can make a claim for wrongful death if someone is killed by airbags? Every state has its own wrongful death law which describes who can make a claim for wrongful death following an airbag accident. Florida Wrongful Death Claim - in Florida, for example, there's a schedule in the law which determines who can make a claim for wrongful death and what damages survivors entitled to collect. A survivor is a person under the law who can make a claim for damages for wrongful death. This is often different than a person named as beneficiaries under a person's will or trust. In a Florida airbag accidental death claim, the surviving spouse generally has a claim for the wrongful death of their husband or wife. Any children of the decedent, or person who was killed by the airbag, may also have a claim for damages as a result of their parents being killed by an airbag. There are also circumstances in which the parents or siblings of the person killed by an airbag may be entitled to damages as a result of the airbag malfunction or defect under Florida's wrongful death act. What damages can a survivor in a wrongful death case recover? Loss of Support and Services - This may include any money that the decedent, or person killed by an airbag, was paying monthly to any survivor or family member, or was contributing financially to the household. This may also include services the person killed by the airbag was providing, like lawn care or child care, and which the family now needs to pay somebody. Emotional Pain and Suffering - These damages are often available to the surviving spouse, and may also include the children of the decedent, siblings, or parents. Compensation for pain and suffering is very hard to quantify. It is almost like asking a jury to decide how much somebody's life is worth. It is impossible to replace somebody. However, consideration has to be made by a jury in this difficult situation of deciding how much an airbag wrongful death case may be worth. By studying other verdicts and settlements in wrongful death cases, there's often a range of what juries may award. Airbag pain and suffering settlements and verdicts in these types of cases may be millions of dollars. Medical Expenses - If the person killed by an airbag inflator malfunction incurred medical expenses before they were killed, Takata or the car manufacturer may be responsible to pay all of the outstanding medical expenses. Do not pay any of the decedent's medical expenses following their death until you speak with an airbag wrongful death lawyer. Funeral Expenses - Takata or the car manufacturer of the vehicle that the person killed was riding in, may be responsible for the funeral expenses of the person who died. These damages may either to be paid to the estate of the person who died or to the person who paid them directly. Property Damage -The car manufacturer or airbag company, which may be Takata, may be responsible to pay for any property damage caused by the airbag malfunction. This may include burns to the interior of the car, scratches, and replacement of the airbag unit, or in some cases even replacement of the entire vehicle at no cost to the estate of the person who died or their the family. Punitive Damages - If the court determines that the airbag manufacturer or car company acted with reckless disregard for the safety of the public, you may also be entitled to punitive damages to punish the company for their actions. Unlike many wrongful death attorneys, our office has its own probate department. This may help to speed up the handling of a wrongful death claim arising out of an airbag malfunction or defect. Generally, in order to pursue an accidental death case after an airbag accident or malfunction, an estate has to be opened. The probate process first begins by inquiring whether the person who died had a will. If the person killed by the airbag had a will, we look to see who the person nominated as personal representative or executor is. That person will typically be the person to bring the wrongful death case on behalf of all survivors. If the person who died from the airbag malfunction do not have a will, laws of intestacy generally come into play. Intestacy laws are laws which determine who the personal representative or executor will be if a person does not have a will. Typically, it is a surviving spouse. If there is no surviving spouse, in Florida for example, a majority of the heirs, like the children, may select someone to be the person representative or executor. Certain people may not qualify to be the personal representative or executor even if they have priority under the will or laws of intestacy. In Florida ,for example, a person convicted of a felony generally may not serve as the personal representative or executor in the case of a wrongful death involving an airbag. Once it is determined who the person representative might be, a petition for administration of the estate is generally filed in the probate court. A probate judge will be assigned to the case. The judge will generally sign an order appointing a personal representative over the estate of the person who died and will also issue letters of administration. These documents permit the personal representative to file a lawsuit or claim on behalf of any survivor entitled to damages as a result of the airbag malfunction, rupture or defect. Once a wrongful death case involving an airbag malfunction is settled, the next phase is processing the settlement or verdict. If all survivors are over 18 and are in agreement as to the settlement distribution, the personal representative or executor can sign the release and authorize the distribution. Some probate judges require that a petition for distribution be filed with the court disclosing the proposed distribution and settlement release so the court can decide if the settlement is in the best interest of the estate and survivors. Once the settlement distribution has been approved, and the settlement release signed by the personal representative, the case is typically ready for payment of the settlement proceeds to conclude the case. Some probate courts may also require that a petition for discharge of the personal representative be filed to formally conclude the case. If any of the beneficiaries or survivors of the wrongful death settlement or verdict are under the age of 18, courts may require additional oversight over the settlement and settlement proceeds. In Florida, for example, if the minor child will receive a settlement over $15,000, the court may require a formal guardianship be opened to oversee the money until the child turns 18. If the gross settlement exceeds $15,000, the court may also require that a Guardian ad Litem be appointed to review the settlement and advise the court if the settlement is in the best interest of the minor child. These protections help prevent a situation where a parent or step parent or grandparent tries to influence the minor child, then takes money from the child that they may not be entitled to. There are ways to avoid a guardianship even where the settlement to the minor exceeds $15,000. Structured settlements may protect the minor child's money until they reach 18 years of age or older, and may keep the money out of the hands of those who may exploit the child. A structured settlement is like a deferred settlement where the settlement to the minor may not actually vest until the child turns at least 18 years of age. Structured settlements are much like the sound, with settlements structured over a period of time. Structured settlements can pay out a lump sum when the minor child turns 18, or maybe structured at different intervals. Some structured settlements can pay out a monthly benefit for the entire life of the survivor, like $300 a month for as long as a survivor lives with a guaranteed benefit in the event the survivor does not live past a certain age. Settlements can also be structured to pay out at intervals like a life milestone payout. For example, the survivor may receive 20% of the payout at 18 years of age, and 20% when he turns 21, 30% when he turns 25, and the remaining balance when he turns 30. An experienced wrongful death attorney can help walk you through the wrongful death settlement process following the death of someone from an airbag. Airbag lawyer Jason Turchin has represented hundreds of survivors in wrongful death cases throughout Florida, New York, and throughout the United States. If you have any questions at all regarding an airbag wrongful death case and whether you may be entitled to money for your pain and suffering or other damages, call us today for a free consultation at 800-337-7755, or submit your airbag claim online today.